Take control of your next B2B marketing campaign! Grab an accurate, organized business database of the qualified sales leads you're looking for. Buy our controller email list if you want the key contact information of controllers and controlling directors nationwide. An email database of controllers like this is the perfect tool for connecting with a high-level group of finance-focused business professionals with a great deal of influence in the corporate world. Controllers control many operations in a company: They often have influence over many aspects of accounting, payroll, budgeting, and taxation, ensuring that all internal audits and information are accurate. Often reporting to the CFO, a controller will have an important say in the state of the budget and whether or not the institution can afford to make a B2B investment. Obviously, these are very important people to get a hold of. Normally, they'd be very hard to connect with, but with this email database of controllers, you'll have all of the information you need to grab their ears (or eyes) in one consolidated resource, which is ready for you to download and integrate into your CRM right now. You'll have accurate email leads with real names (with no generic versions like [email protected]), allowing you to conduct an email marketing campaign. You'll have postal addresses, allowing you to send mass mailings to numerous leaders of controlling offices and departments. You'll also have phone numbers, giving your sales team the opportunity to speak directly with controllers. 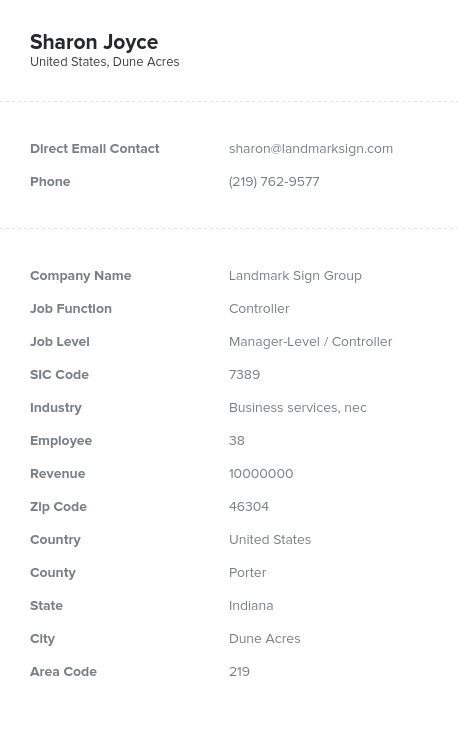 With this all-in-one controller mailing list, you'll have the information you need to influence a controller and perhaps their entire company! Buy this controller email marketing list and take control today!